Enjoy your favorite beer pong games the way they were meant to be played, family-friendly and at an even larger scale, with the Get Out! 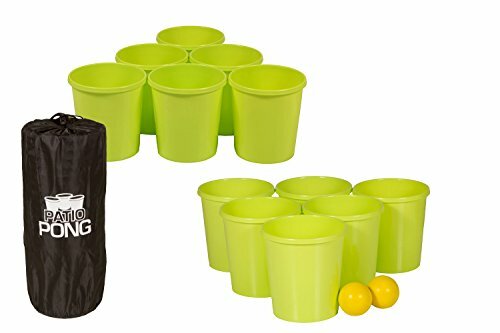 Patio Pong - Giant Yard Beer Pong Set for Outdoor Fun - 12 Buckets, 2 Balls, 1 Drawstring Carrying Bag. Play with 2-4 players and 2 teams. Simply place 2 sets of 6 buckets in a triangle formation 18-30 feet apart. Players try to throw the ball into the opposing team's buckets. If a ball goes into a bucket, it is removed from the game. The team that makes all of the buckets first wins. Our game set provides the best outdoor playing experience and won't easily blow around in the wind. The nylon drawstring carrying tote bag makes for simple storage, easy transportation, and organization. This package includes (12) buckets, (2) game balls, and (1) bag. If you have any questions about this product by Get Out!, contact us by completing and submitting the form below. If you are looking for a specif part number, please include it with your message.